Pool has come a long way from being something which was played casually at pubs and bars to a professional level game. This is the very reason behind the growing demand of a good pool table in households as it serves as an excellent choice of entertaining your guests. However, given the shortage of floor spaces, we are constantly on the lookout for space saving options and that is what has led us to the inclusion of pool dining table in our households. Today, we are going to take a look at five such beauties which can serve the dual purpose of aesthetic pleasure and functionality but first we are going to take a look at the things to consider before purchasing one. Slate as we all know refers to the main playing arena of the pool table and is set under the cloth. You can take your pick amongst one and three-piece slate wherein the latter is more popular in comparison to the former. Budget also has a big role to play in shaping your purchase decision. 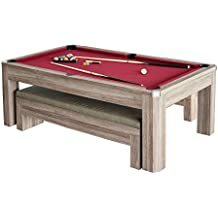 You can go for a second-hand model if you are running on a stringent one although it is advisable to purchase a high-quality pool dining table as it provides complete value for money. You need to carry out a space check at your house prior to purchasing a pool dining table as there needs to be ample space for taking the shots with perfection. The size of the cue used also has a pivotal role to play in shaping your purchase call. You also need to ensure that the table has two cross beams and one center beam for providing adequate support by distributing its weight evenly. The multi-game table by Hathaway is bound to delight people of all age groups with its simple yet quality construction which makes toggling between fun and function seem like childsplay. Engineered wood imparts stability and security to the Park Avenue table to ensure smooth and professional play while protecting it from scratches and dings. This efficient multi-tasker is smaller than a regular pool table but can enhance your possibilitiesat the drop of a hat. Individual levellers on its leg panels make it easy to adapt with the imperfect floor surface in a perfect manner. ¾ inch MDF which goes into the construction of this table comes covered in durable black laminate for achieving superior-quality construction. Some other attributes which deserve special mention are its chrome plated corner caps, premium nylon/wool blended top layer, tournament tested True Roll bumpers and ½ inch round inlayed sights. Table tennis accessories comprise of posts, net, 2 paddles and 2 table tennis balls whereas Billiard accessories consist of two 57” pool cues, rack, 2.25-inch pool balls and cue chalk. This 7’ multi-functional table from Hathaway combines a dining with fast-paced table tennis and classic pool in a functional table top. While matching benches having plush seat cushions and built-in storage options complete the entire set, hydraulic EZ-lifers make opening and closing the bench seat top seem like childsplay. You can thus enjoy the best of comfort while keeping your game accessories organized during parties, family gatherings and conference meetings. Internal storage in each bench is assisted with hydraulic lifters which provide seamless accessibility. Fast and accurate ball rebound guaranteed by the K-66 gum rubber cushions. Dual lightweight top pieces make switching between games and functions a hassle-free affair. Simple and space-saving design is ideal for smaller spaces. Comes with a 180-day manufacturer warranty. Constructed using high quality engineered wood for imparting greater durability. Bulky nature makes it difficult to carry around. The Carmelli NG2530PR can serve as the best bet for billiard aficionados who wish to bring home a high-end table without going overboard with the price. The particularly modern design sported by this popular table in red and black is bound to serve as a focal point of attraction in your existing room décor. The 7 feet pool table by Carmelli is bound to mesmerise you with its simple styling and quiet power. However, behind the veil of these clean lines is a handsome table which can be converted easily from a craft or dining one to a full-blown pool or table tennis table. ¾ inch of certified MDF which goes into the construction of this table is covered in a durable black laminate to provide hours of excitement and family fun for spicing up those get-togethers. The entire set is completed by plush leatherette padded seat cushions and built-in lined storage. 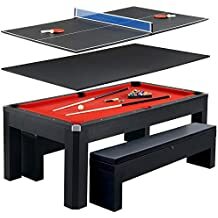 This space saving table comes with table tennis accessories such as posts, net, 2 table tennis balls and 2 paddles as well as pool table accessories like two 2-piece 57” pool cues, 1 plastic triangle, 2.25-inch pool balls and chalk. High quality blend of nylon and wool in the classic shade of red covers the playing surface of this versatile table whose effervescent style can easily blend into your existing home aesthetics. The slate table has been specially manufactured to be consistently level so that you can make the most out of competitive games. While the tournament tested True Roll bumpers pave the path for predictable ball return, chrome-plated corner caps further adds to its premium look. Comes with a manufacturer warranty of 180 days on all the parts and accessories. Sturdy construction which can take on rough use for long spans of time. Accompanied with two upholstered benches having built-in storage for keeping gaming accessories. Removable table top which makes the switching mechanism from fun to function an extremely easy affair. Comes with age restrictions for younger children. It is time to cater to the air hockey enthusiast in you with the multi-functional 7” table from Sherwood which can keep you and your family entertained for hours. 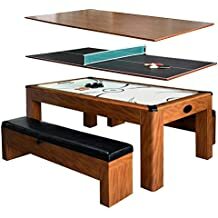 This full-sized table can seamlessly fit into your existing room décor while opening up newer possibilities of gameplay. The unique combination of traditional Parlor Style Drop Pocket Design and sturdy CARB certified MDF material makes the table durable enough to withstand heavy-duty usage. Clean design lines covered in exquisite Cherry melamine showcases the rich texture of cherry wood. The competition air blower system and super-slick play surface delivers accurate air hockey table play. 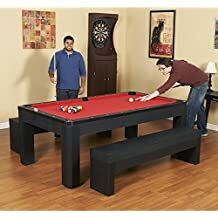 Matching benches which accompany the handsome table feature soft padded seat cushions and built-in storage for providing convenient and comfortable seating options while keeping the game accessories organized. The dynamic table comes with four red competition pucks, four black pro series strikers, two paddles, table tennis net and posts as well as two table tennis balls. The in-rail electronic scoring display helps in converting the Sherwood table easily into a full blown competitive air hockey or table tennis table from a craft or dining one. You can thus bid adieu to the concept of raised scoring which are infamous for hindering your experience. Super slick air blower system and play surface. Soft padded benches featuring built-in storage. Hydraulic EZ-lifters help in opening and closing the bench seat top in an effortless manner. Multi-functional table which can keep your entertainment meter satiated for long. 6 months’ warranty provided by the manufacturer. Adjustable legs ensure a fair game time and again. Requires separate assembly which can be a time taking affair. The simple yet stylish pool and dining table from Hathaway can easily blend with your existing room décor whether you keep it at the basement or garage. Pool lovers are bound to fall in love with its driftwood melamine side, leg and end panels which can make it resistant to scratches and similar corrosion. This rustic-style table featuring crisp contemporary lines is covered with beautiful driftwood melamine which showcases the natural imperfections and rich grain of reclaimed wood in all its glory. Some other attributes which deserve special mention are its round inlayed sights, chrome-plated corner caps and tournament-tested “true roll” bumpers. Billiards set comes with 2.25-inch pool balls, two 57-inch pool cues and cue chalk whereas the table tennis set comprises of two paddles, net, posts as well as two table tennis balls. This versatile offering from Hathaway can serve as the ideal solution for conference meetings, parties and large family gatherings where you wish to both entertain your guests and keep their tummy satiated with your culinary skills. The playing surface is covered with a unique mixture of wool and nylon which is available in the warm shade of red. Comprises of independent leg levellers having end, side and leg panels. Multipurpose table which can be converted into a dining table or pool/tennis playing arena. Comes with a plethora of accessories such as pool cues and drop pockets to make the whole thing easier for you. Benches having a soft cushion top imparts greater comfort while also catering to storage woes with its intelligent construction. Requires assembly time of about 45 minutes. Meant only for indoor usage. Although most of us wish to own a pool table for indulging ourselves as well as our house guests in the game of eight balls, we hardly have enough space for the same. It really gets gruelling to line up a tough shot without hitting your cue against the wall which is why Carmelli has come up with this versatile solution which has been specially constructed for outdoor usage. 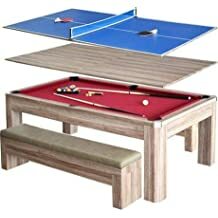 This 3-in-1 table can be easily converted into a dining table or table tennis board whenever felt necessary. This handsome table is crafted beautifully out of CARB certified MDF material for adding to its longevity and durability. Hydraulic EZ-lifters in the benches assist the seat top in opening and closing effortlessly. Dual padded benches apart from offering comfort whenever you wish to rest for a little while can also offer storage solutions for game equipment. It is accompanied with cue chalk, 2 balls, posts, table tennis net, 1 plastic triangle, 2 paddles as well as two pieces of 2.25” pool balls and 57” pool cues. Its stylish red and beige design is bound to usher in complements as you engage your guests in a game of table tennis as well as ping pong with its reversible top layer for hours of gaming fun. The artistic as well as rustic driftwood melamine top rail coupled with ½ inch white inlay sights and corner castings plated with chrome ensure the dual combination of looks and efficiency. Multi-functional table providing ample space for storing accessories. Ideal choice for conference meetings, large family gatherings and parties. Made with high quality nylon wool blend. Lots of space is required for accommodating this pool table. Heavy table which takes a lot of work to get unloaded. If you wish to experience the professional playing quality of a slate bed pool table having protective hard covers and shallower cabinet which can help in transforming it into a magnificent dining table within a matter of few minutes, then pool dining tables can serve as your ideal option. The five best pool dining table combos mentioned in our list is bound to cater to all your requirements with its effective attributes. These beautifully designed pieces are manufactured with the best of materials to serve the test of time as well as well as offer complete value for every single penny spent.